Lock in a great price for Hotel Palazzo Wellness & Relais - Capitano Collection – rated 9.1 by recent guests! The room, the staff, the location, the abundant breakfast, the relax and everything was working perfectly. Rarely I found myself so content and happy in a hotel. Nice boutique hotel centrally located to many of the area attractions; unique decoration; the staff is attentive, helpful and professional; good WiFi. Room was beautifully decorated, lovely view into the garden. Location was central in the town. Jacuzzi in the garden was nice. Good spread at breaky & friendly staff. Staff were very thoughtful and accommodating. They were very active in making sure we were well taken care of. Nice location and excellent breakfast variety. Charming atmosphere in the rooms and around. Great location, friendly and attentive staff, rooms and bathrooms very clean, excellent breakfast, great level to attention to details. Beautiful garden. Generous checking-out time. Good place to use as a base for visiting Val d'Orcia though the parking is a little bit far. Hotel Palazzo Wellness & Relais - Capitano Collection This rating is a reflection of how the property compares to the industry standard when it comes to price, facilities and services available. It's based on a self-evaluation by the property. Use this rating to help choose your stay! 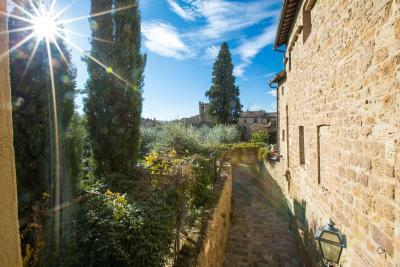 Set just inside San Quirico d'Orcia's historic town walls, Palazzo del Capitano is a charming 15th-century building. It features a wellness center and 1000-m² garden with vegetable patches and fountains. This property is surrounded by olive groves and Mediterranean gardens where you will find plenty of sun loungers. The wellness center includes a hot tub, a Turkish bath or a massage. It is available upon reservation and comes at extra charge. The rooms are decorated in a rustic style, with wooden-beamed ceilings, antique furniture and terracotta floors. They all have satellite TV and free Wi-Fi. Breakfast is buffet style at Palazzo del Capitano Relais & Wellness. 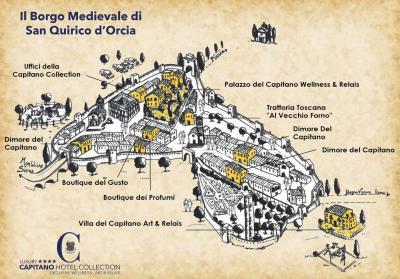 There is also the relaxing Zodiac Lounge and the Vecchio Forno restaurant, which was once the stables. This Michelin-recommended restaurant serves Tuscan food and wine indoors by the fireplace or outside under the olive trees. 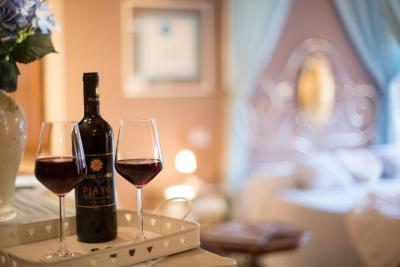 Set in the Val d'Orcia area of Tuscany, the hotel is 25 minutes' drive from Montepulciano, famous for its wine. 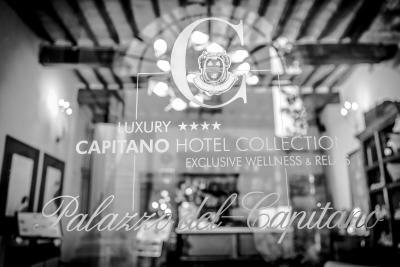 When would you like to stay at Hotel Palazzo Wellness & Relais - Capitano Collection? Old-fashioned style room with wood beam ceilings and terracotta floors. It has free Wi-Fi, a flat-screen TV with satellite channels, and a private bathroom complete with toiletries. Some rooms have views of the surrounding garden. Large old-fashioned style suite with wood-beamed ceilings, terracotta floors, and some offering a four-poster bed. It features free Wi-Fi, a flat-screen TV with satellite channels, and an private bathroom complete with toiletries. Some suites offer views of the surrounding garden. 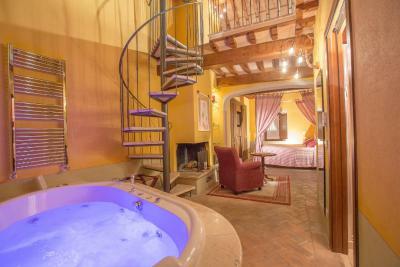 Room located in a separate characteristic building in the historic center of San Quirico D'Orcia. Rooms are set between 80 and 492 feet from the hotel, where breakfast is served and facilities are located. Check-in takes place at the hotel. This Tuscan-style room features a private bathroom with shower box and Erbario Toscano toiletries. It includes an LCD TV, work desk and free WiFi. 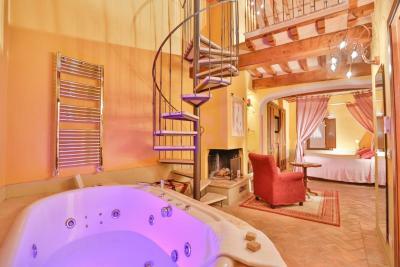 Large suite with a four-poster bed, lounge area with fireplace, and 2-person hot tub with chromotherapy. Offers a flat-screen TV and free WiFi. It is decorated in an old-fashioned style with wood-beamed ceilings and terracotta floors, giving to the suite a characteristic Tuscan atmosphere. The bathroom is complete with crystal shower and Erbario Toscano toiletries. This room is decorated in an old-fashioned style with wood-beamed ceilings and terracotta floors. It offers a four-poster bed, a bathroom complete with Erbario Toscano toiletries, free WiFi, and a flat-screen TV with satellite channels. Some rooms offer views of the surrounding garden. With a four-poster bed, an in-room hot tub for 2 people and a fireplace. Also features a bathroom in travertine marble and a crystal shower box. Includes a 90-minute private access to the spa and 2 massages per day. 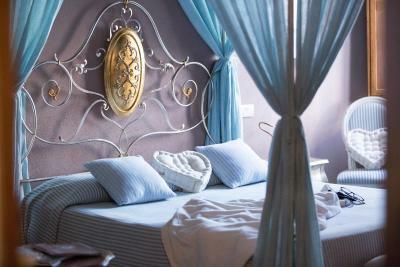 With a four-poster bed, period furniture and terracotta floors. This room has exposed wood-beamed ceilings and a travertine marble bathroom with crystal shower box. Includes 2 massages per stay. With exposed wood-beamed ceilings and terracotta floors, this suite offers free WiFi, a satellite flat-screen TV and a bathroom with toiletries. Some rooms have a four-poster bed or a view of the property garden. House Rules Hotel Palazzo Wellness & Relais - Capitano Collection takes special requests – add in the next step! Hotel Palazzo Wellness &amp; Relais - Capitano Collection accepts these cards and reserves the right to temporarily hold an amount prior to arrival. Hotel Palazzo Wellness & Relais - Capitano Collection accepts these cards and reserves the right to temporarily hold an amount prior to arrival. Please note that the spa center is available for an additional fee. The hotel is located in an old house, so be mindful that there are many stairs for reaching your room. WiFi, through free, requires to provide personal info which leads to receive unwanted newsletters by email... no, no! I really appreciate the entire staff! Such nice, experienced and helpful people.. I would recommend everyone to stay here in Val d orcia! it's a magic place. Rooms are amazing, Toilets superb, the communal areas are great. Staff is superb. Would stay again! Everything was perfect, no complains in regard of any detail of the hotel. There are no negative points I can give, maybe internet could be a little faster but it is not an important matter. Minor - the Toro suites is small and stuffy (we have to check-in and one carry-on luggage), poor quality lighting plus unpractical furnitures arrangement in the room (the big chest place next to the full-length walled mirror that all the possible lighting coming from either the ceiling lights or the window light); the parking instruction to the public parking lot is confusing. The food at Ristorante Trattoria Toscana "Al Vecchio Forno” is tasteful but very salty. Major - very bad sewage smell in the bathroom. We had an executive room (Toro) which is long and narrow, with a strange seating space up near the ceiling at one end. The bathroom was good BUT the air con could not cope and the room became very hot and airless. Beautiful building and with a lovely garden and restaurant. The breakfast room was lovely, staff very friendly and helpful. Furnishings and ambience superb. No lift... The bedroom and bathroom is big but the bath rub is quite old and you feel that is dirty. The hotel is inside the town. If you drive a big car to drop your luggages might be bit difficult to come inside the town. The breakfast was very good. The guy originally from Sri Lanka at breakfast was very nice as well. The garden is pretty. Toiletries stuff are quite nice. There's no parking but we used a public parking lot very close by.